The Affordable Care Act (ACA), also known as Obamacare, sought to do something revolutionary in the United States, which was to not only make health care available to everyone, but to simultaneously eliminate the negative impact that its predecessors had on people with pre-existing conditions, which disproportionately affected people with disabilities, those with low incomes, and women. Old forms of health care lumped people with pre-existing conditions together under a pre-existing conditions category, which ultimately led to high-risk pool placement and an array of associated high costs. Historically, people placed in high-risk pools have had pre-existing conditions that were deemed too expensive by insurers. Pools offered exorbitantly-priced premiums, with insurers able to charge up to 200% above private individual market rates; annual and lifetime caps were placed on recipients’ medical expenses, and before people could receive care, most had to pay $1,000 or higher for their deductibles, and in some states, $5,000 or higher. People placed in high-risk pools are also often subject to annual and lifetime limits on their health care expenses, ultimately leaving them without the means to pay for their necessary health care expenses once they cap out. 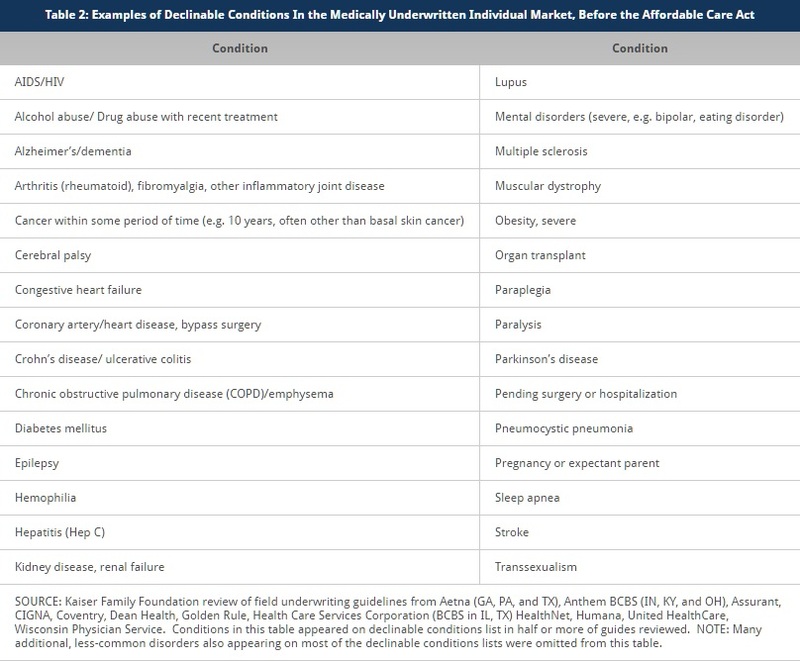 Below is an image of a list of pre-existing conditions, such as cerebral palsy, paralysis, and muscular dystrophy; for a more comprehensive list, visit Kaiser Family Foundation’s website. Fielding costs like these is a burden, particularly for people with low incomes, which overlaps with the portion of the population with disabilities. In 2015, 27% of people with disabilities lived below the poverty line in the United States; in Mississippi and New Mexico, it is higher than 33%. Obamacare requires that everyone have health insurance or opt out and pay a fee; because of this model, people with low incomes who also have expensive pre-existing conditions can more comfortably afford care. The American Health Care Act (AHCA), also known as Trumpcare, proposes that the country regress to old forms of health care that separate people with pre-existing conditions from the rest of the market and drive up their costs so that people with fewer health care needs can save. Backers of the AHCA claim that people with pre-existing conditions will be taken care of because states will be allotted two buckets of funds, one of which is specifically for people placed in high-risk pools, the second of which states can use as they see fit. However, the funds from the second bucket could potentially be transferred to the first bucket if needed; realistically, this money could run out or insurers could choose to charge high premiums and deductibles in order to avoid pulling from both buckets. Currently, insurance subsidies or grants are available to people if they meet certain qualifications, one of the main ones being that the individual would have to be deemed ineligible for coverage through an employer or a government health care program for at least one month in the year. Another primary qualifier is recipients’ incomes must be at or below 100-400% of the federal poverty level. Under the AHCA (Trumpcare), people meeting these qualifications would receive a tax credit instead, which would not exceed $4,000 regardless of health status. Thus, a 60-year-old in the low-income bracket (around $20,000/year) with a pre-existing condition, who has significant health care needs, could see his or her aid drop by thousands of dollars. The most vulnerable members of our society are in danger of losing essential health care, and it boils down to the new administration and its constituents wanting to save some money, rather than take care of all members of society. Whether it’s you or someone you know that may be affected by these changes to our health care system, the time to speak out is now. Hop on social media, share your story, and tag it with #IAmAPreexistingCondition. People with pre-existing conditions are sharing their stories all over the Internet with this hashtag, bringing to light how their needs are in danger of being set on the back burner. Contact your state’s representatives. It is their job to represent you and your interests. You can find your representatives on the USA.gov’s elected officials page.